We’ve all heard a lot lately about “fake news.” Most people think its rise is the result of political gamesmanship. But actually, the primary driver is economics. As we all know, more web traffic means more advertising revenue, regardless of whether your content is legitimate or fake. It’s more important than ever for brands to partner with an agency committed to employing every tool and making every effort to ensure valuable ad budgets are spent on relevant human audiences and quality sites. 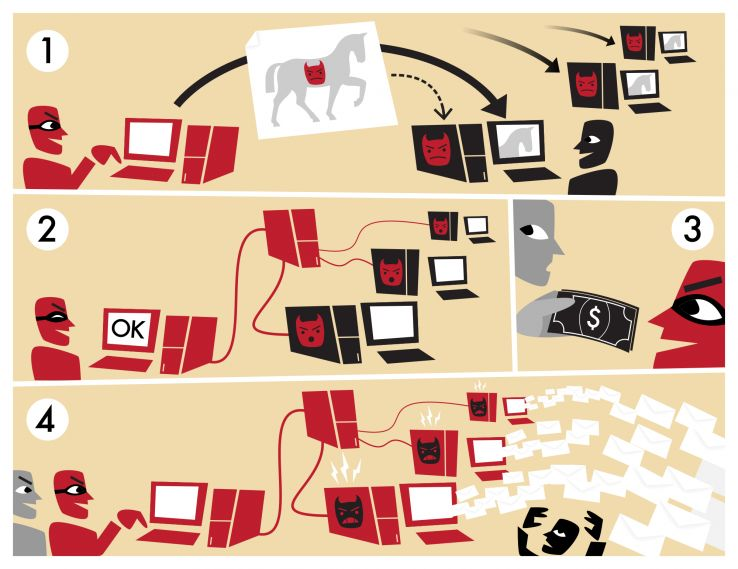 There’s a great Washington Post article that explains how digital ad fraud, fake news and bot traffic are all interconnected in one giant money-making scheme. According to Entrepreneur.com, “Billions will be lost to ad fraud this year, and ~37% of ad impressions will come from bots.” The World Federation of Advertisers forecasts that by 2025, ad-fraud losses will total over $50 billion, making it the second-largest organized crime in the world, behind only illegal drugs. Clearly, a significant faction of site publishers will stop at nothing to skim money from well intentioned advertisers’ budgets. So the question is, what can marketers do to protect valuable digital ad budgets from these wicked schemes? But before we discuss safeguards and solutions, let’s see some examples of what we’re up against. 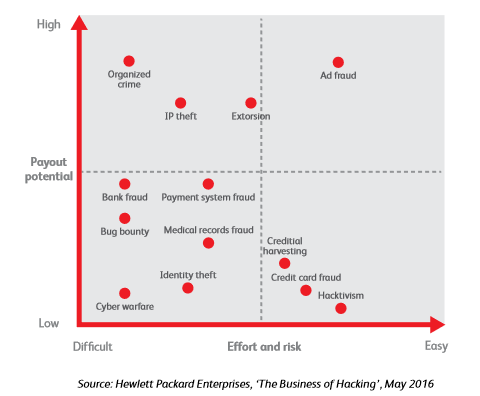 How do publishers commit digital ad fraud? Ad fraud is a crime that has low-risk and high-reward. In fact, as you can see in the chart below, there’s a lot of money to be made in ad fraud, and it requires very little effort. There are various tactics that disreputable publishers will use to commit digital advertising fraud. These sites make money hand over fist by sending waves of bot traffic to their fake content, thereby driving up the price of their ad space. To the untrained eye, the homepages of these sites make them appear legitimate. But digging a little deeper into the site architecture reveals just how useless their ad space really is. Digiday interviewed a former fake-web-traffic buyer who was at one point spending between $10,000 and $35,000 per day on bot traffic. The single largest instance of ad fraud occurred in January when Methbot defrauded advertisers of $5 million a day by faking 300 million video views. To make matters worse, some major supply-side platforms (SSPs) provide their services to the publisher on a don’t-ask, don’t-tell basis, turning a blind eye to the authenticity of the site traffic. The publishers then mark up their cost per thousand price and sell their ad inventory on ad networks and ad exchanges. Publishers have an easier time hiding their bot-traffic schemes when ad agencies purchase inventory through demand-side platforms (DSPs) based on audiences, and not on site placements. If these phony publishers are ever discovered by ad exchanges and/or SSPs, the penalty is blacklisting (a temporary slap on the wrist, since they can easily replicate those same schemes under new domains). Whether they know it or not, every link in the ad-tech supply chain benefits from these schemes, from the bot-traffic provider, to the publisher, to the SSP, to the ad exchange/network, to the DSP, and even the ad agency. Of course, not every cog has malicious intent, but that doesn’t soften the blow for unknowing advertisers. Luckily, there are also good guys in this space—guys like Marc Goldberg, CEO of publisher-verification firm TrustMetrics—who are detecting the fraudsters and reporting them to ad exchanges, SSPs, etc. Dr. Augustine Fou is an ad-fraud and cybersecurity researcher with a PhD in Materials Science & Engineering from MIT. His recent blog debunked the myth that the only victims of ad fraud are advertisers with large media budgets, and he went on to challenge agencies and advertisers to be more proactive regarding ad fraud. Agencies like SeQuel are answering Dr. Fou’s call by integrating fraud prevention/detection into programmatic media buys. That includes the use of whitelists, DSPs with proprietary anti-fraud technology like Dstillery, and pre-bid technology from ad-tech firms like Integral Ad Science. Most advertisers limit their exposure to ad fraud by aggressively utilizing paid search and paid social before allocating budget to programmatic ads that are unfortunately served to the rapidly growing number of fraudulent sites across the web. Of course, many, many sites are perfectly legitimate. During January’s Industry Preview in New York, our team spoke with the programmatic manager at weather.com, and they take numerous proactive steps to limit bot traffic to their site. But by and large, “walled gardens” like Google Search, YouTube, Bing, Yahoo, Facebook, Instagram, LinkedIn and Twitter are safer options. There will always be some bot traffic going to these sites, but since these ecosystems don’t rely on third-party publishers for ad revenue, the potential payback for fraudsters is inherently limited. We don’t expect the digital advertising landscape to be clear of ad fraud or fake news anytime soon. In fact, it’s very likely to get worse. That’s why it’s more important than ever for brands to partner with an agency committed to employing every tool and making every effort to ensure valuable ad budgets are spent on relevant human audiences and quality sites.